I was so exhausted last night that I fell asleep right after dinner without even unloading my bike or changing my clothes. Good thing the cowboys I was sharing the bunkhouse with were all honest fellows who didn't go through my panniers, or else they could have set themselves up with a bunch of great cycling gear. Come to think of it, I've never seen a cowboy on a horse in spandex so maybe they did go through my stuff and decide against borrowing any of it. When I awoke the immediate aching in my legs told me that despite twelve hours rest I still wasn't completely recovered, and I debated whether I wanted to sleep over another night or keep on riding. As much as I could have used more rest, Jackson is a tourist town and a pretty expensive place to stay. In fact, I was paying more for a bed in a flophouse than I had for a motel room in other towns. In the end I decided to compromise by letting myself linger in Jackson until early in the afternoon and then only riding a moderate distance through Grand Teton National Park to the next campground. 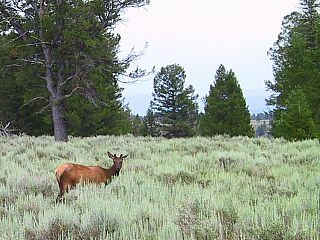 The Teton Mountains are the youngest range in the Rocky Mountains, and were formed when two rectangular blocks of the Earth's crust drove against each other along a fault line. One block swung upwards and the other hinged downwards, and as a result the Tetons appear to thrust skywards with no intervening foothills to detract from their majesty. 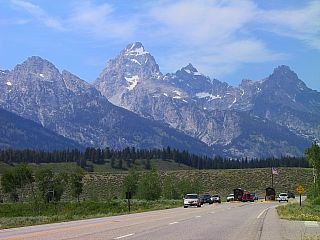 The Teton Mountains were named in the early 1800's by lonely French trappers who thought they resembled, well, tetons. As this lonely bicyclist will attest I too can see the resemblance, although if you caught me when I was hungry I might say they more resemble mounds of ice cream topped with whipped cream and cherries. Once again, the heat of the day was oppressive and the miles were ticking by ever so slowly, when my prayers were finally answered by a cover of storm clouds that rolled in and provided a welcome break from the sun. Although at first I feared being caught in another thunderstorm, the rain and lightning never materialized and the cool weather kept me company all the way to my camp at Colter Bay. The campsite next to mine was occupied by a group of thirty-one cyclists from Yale University who are crossing the country to raise money for Habitat for Humanity. Because they are on a route of their own design, they have met very few other cyclists and were duly impressed by the fact that I had hauled a ninety-pound bike over three thousand miles. The ones I talked to, like myself, had no real cycling experience before jumping into this trip and were having a great time. How was the side trip to Jackson? Was it worth the detour to check out?